It's doesn't come as a shock to find that Studebakers haven't made much of a showing in this series (so far we've had just an Avanti), given that the Studes were never all that common even back in the day. 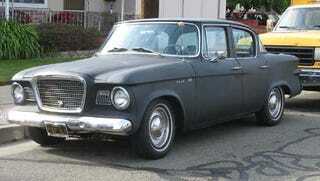 But hey, at least the Studebaker Pines are still standing tall, and so is this quasi-rat-rodded '60 Lark VIII! The Lark was Studebaker's last-ditch attempt to regain some sort of toehold in the American car marketplace, and it didn't sell too badly. That wasn't enough to prevent Studebaker from abandoning ship in '63, (though they limped along a few years longer in Canada). The "VII" emblem means this car has the V8 engine, though in '60 that could have been either the 259 or the longer-stroke 289. With its primer black paint and somewhat de-trimmed state, it's hard to tell whether this Lark is on its way to fresh paint or a more rodent-like appearance. It's definitely showing some East Bay pride with its big 510 emblem, either way. This rear window treatment looked plenty dated by the 60s, but Studebaker had to work with what they had. Nearly 50 years later, it looks pretty good. Is it just me, or does the Volvo 164 grille we saw yesterday bear an uncanny resemblance to this one?